L to R: Derek Polischuk, MSU associate professor of piano; Deborah Moriarty, MSU piano professor; Lori Frazer, PROGRAM SPECIALIST, Yamaha Music and Wellness Institute; Kalil Olsen; Merritt Lutz; Ann Olsen; Jimmy Edwards, president, Marshall Music. 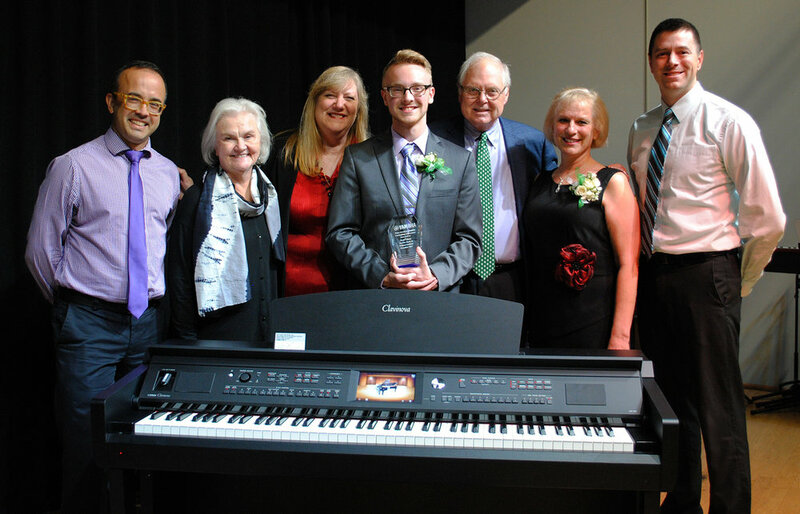 November 28, 2017 - Kalil Olsen, a 17-year-old high school student from East Lansing, Michigan, was named the first recipient of the Brian Jemelian Award for Outstanding Achievement, following his stellar piano performance at the week-long festival, "Celebrating the Spectrum" held at Michigan State University this past summer. The award was presented by the Yamaha Music and Wellness Institute (YMWI) during a special ceremony this week on Giving Tuesday in Lansing, Michigan. It recognizes the exceptional achievement of talented, young musicians across the United States and was established in memory of Brian Jemelian, who passed away in July, having served as a senior vice president at Yamaha and as a member of the board of directors at YMWI. In addition to the award, Yamaha Corporation of America presented Olsen with a brand new Clavinova CVP-705B digital piano, while Marshall Music donated the move of the instrument to his home. Olsen, a musician on the autism spectrum, has been playing piano, along with other instruments, since early childhood. Olsen is a senior at East Lansing High School and studies with Dr. Derek Polischuk, MSU associate professor of piano, who also teaches students on the autism spectrum. Last summer, Dr. Polischuk urged Olsen to enroll for a second year with “Celebrating the Spectrum: A Festival of Music and Life,” an innovative program held at the College of Music’s Cook Recital Hall on the Michigan State University campus. The festival, developed by Polischuk and MSU Piano Professor Deborah Moriarty in coordination with the MSU RAIND program (Research in Autism, Intellectual, and Other Neurodevelopmental Disabilities), is designed to give qualified advanced pre-college students on the Autism spectrum a preview of college life, complete with dorm living and a rigorous schedule similar to most MSU music students. Olsen’s two-year enrollment in the program was sponsored by MSU alumni Merritt and Candy Lutz who have a severely autistic son, Reed. Learn more about the Lutz family in the MSU Spartan Saga spotlight. When Lori Frazer, Yamaha consultant to YMWI, met Olsen and his mother, Ann, at the festival, she learned about the dilapidated condition of the family’s piano. To further his music education, he needed a decent instrument that could play the full range of keys and sound, and his mother has long dreamed of having a beautiful piano for her son to practice on at home. Ultimately, it was Olsen’s need and exceptional talent that were the reasons for him being named the first recipient of the award that also remembers Mr. Jemelian. And for Olsen and his mother, Ann, it has been a dream come true. Celebrating the Spectrum: A Festival of Music and Life is coordinated by the MSU College of Music and sponsored by Michigan State University as part of the RAIND Program, with generous support provided by the MSU Office of the Provost, and the following corporate sponsors and donors: Sparrow Health System and the MSU Federal Credit Union, as well as generous support from MSU alumni and friends: April Clobes and Glen Brough, Lauren Harris, Merritt and Candy Lutz, Jack and Karen Noonan, along with support from the Frances Baldwin Mulnix Endowment Fund at MSU. Special thanks to Dean Trailways for generously providing all transportation needs for festival participants. Private support helped provide dollars to sponsor each student participant, enabling them to attend the festival tuition free. Funds also covered stipends for College of Music student mentors who buddied-up with the festival participants. Yamaha Music and Wellness Institute is a not-for-profit 501(C)(3) organization dedicated to interdisciplinary development, scientific investigation, professional training and clinical amalgamation of active music participation strategies with integrative evidence-based medical insights for the purpose of enhancing quality of life for individuals of all ages regardless of race, ethnicity or disability.